The World Museum Liverpool has some substantial Fijian collection from Fiji and its neighbouring island groups. Within these collections are materials that were collected in the late 19th and early 20th century by one of Fiji’s early colonial administrators, Sir Everand Im Thurn, Governor of Fiji 1904-1911. 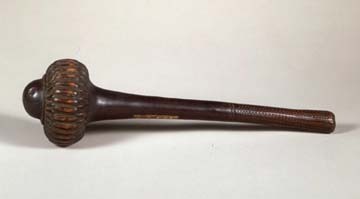 Iula tavatava (throwing club); wood; 45cm x11cm. Collected by Sir Everand Im Thurn in Fiji between 1904-1910. World Museum Liverpool, 56.24.521 (photo: National Museums Liverpool (World Museum).